On the back of last Monday's excellent performance against Newcastle, QPR followed it up with another superb performance, but this time, we got the goals we deserved and ran out comfortable, 3-0 winners at Molinuex. Just as we hit the M42, we were nattering away when Talksport announced there was a Premier League game in doubt and it was, at Wolves. There had been a power cut across the City and the game was definitely, at risk of being postponed. This news was backed up by a text from Smithy, who stated whilst having his breakfast, all the lights went off and he was now in a pub in total darkness!! Thankfully, by the time we reached Wolverhampton, normal service had been resumed and the game was to go ahead as planned... and thank goodness it did!! 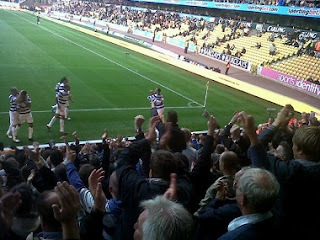 On 8 minutes, Shaun Wright-Phillips was given plenty of room on the right and laid on the ball for Barton, who despite seeming to scuff his shot, got enough on the ball to get it past the Wolves keeper and the R's fans went bananas at the other end! Just 2 minutes later and we were in dreamland when, after some decent build up play, the ball fell to Faurlin who lashed in a 20-yard left-footed shot into the bottom corner - 2-0 to the Superhoops!! Rangers continued to dominate the half and Wright-Phillips, Joey Barton and Adel Taarabt both had good chances and Anton Ferdinand saw his header cleared off the line. But some of the football the R's were playing was quite superb and the only real disappointment was that we were only two nil up, with Wolves offering very little in return, much to the home fans annoyance. 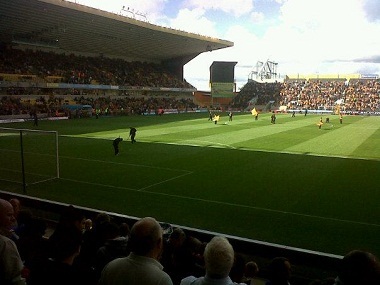 Onto the second half and Wolves made a couple of changes and most expected an onslaught. But although more competative, Wolves rarely threatened and the games momentum slowed down somewhat. But when Rangers came forward, they always looked dangerous and Wright-Phillips saw his shot rebound off the post and into the arms of the grateful Hennesey and Rangers were now in total control. The icing on the Rangers cake, came in the 87th minute - Wright-Phillips played in the very impressive Traore, who teed up DJ Campbell to poke the ball home, much to his delight and the travelling R's contingent. Before the final whistle, there was some fun and games as Joey Barton went down in front of the Wolves fans, who took great delight in giving him a bit of stick. Barton completely lapped it up and responded with a 3 fingered salute, which strangely, didn't go down awful well with the home support, but was extremely entertaining all the same. Barton and Stephen Hunt later exchanged words after the game had ended, before the R's Captain, joined his team mates in celebrating an excellent away win in front of the R's faithful. QPR: Kenny, Derry, Gabbidon (Hall 84), Taarabt, Bothroyd (Campbell 74), Faurlin, Traore, Barton, Young, Wright-Phillips, Ferdinand. Subs: Murphy, Buzsaky, Connolly, Puncheon. Man of the Match - again, with such a great team performance, is so difficult to pick out an individual. But both myself and PK both agreed, that todays award should go to Armand Traore. Who, was not only outstanding defensively, but outstanding coming forward also and rounded his day off by assisting the third Rangers goal. Lee will be returning the favour next weekend as the R's take on the currently, unbeaten Aston Villa at Loftus Road on Sunday. Despite dominating proceedings, the new look QPR, had to settle for a point in what was one of the best 0-0's you will see all season, in front of the Sky Cameras at Loftus Road last night. In what seemed like an eternity since our last outing, R's fans were eagerly awaiting this fixture after being extremely active in the transfer window. Unfortunately, just myself, Lee, Corp, California Hoop and Steve, were in attendance as various reasons kept the remainder away and with the excitement building before kick off, we were all in our seats way before kick off with much anticipation. Although the news was put out on Twitter, the sight of Jude the Cat returning to the Loftus Road pitch shortly before the teams came out, was great to see. As you probably remember, Jude lost his place as QPR's Mascot during the past ownership regime, when a black cat was deemed to be unlucky for Italians. He was replaced by Spark the Tiger, who was also in attendance last night but it remains to be seen if there is still room for two big cats in the Stadium. A very warm welcome back, Jude!!! As the teams entered the field shortly after, Rangers had 6 debutants in the squad, 5 of whom were starting - interestingly named Captain, Joey Barton, Armand Traore, Shaun Wright-Phillips, Anton Ferdinand and Luke Young, all lined up in the Blue and White Hoops, with Jason Puncheon having to make do with a place on the bench. There had been a lot of press and such building up to the game with Barton facing his old club of course and many thought the decision to give him the Captaincy was to calm him down a bit, but further rumblings amongst the R's faithful, seem to suggest he is the new, QPR Captain for the season. Onto the game and despite all the euphoria, Newcastle had started the season extremely well and this was always going to be a tough match. But the R's started brightly with Adel Taarabt forcing a low save out of Tim Krul, while Shaun Wright-Phillips headed over Armand Traore's cross. Minutes later, Newcastle had what was there best chance of the game and Leon Best brought a fine save from Paddy Kenny. Rangers continued to bombard Newcastle goal and created chance after chance. Jay Bothroyd was a bootlace away from Wright-Phillips low centre and later had a header cleared off the line. Faurlin was then denied by a brave defensive block which deflected his effort over the bar. Wright-Phillips was back amongst the action yet again and thought he had given QPR the lead just before the break when he latched onto Taarabt's ball and delightfully chipped the ball over the advancing Krul, only to be see Taylor clear off the line - it was ALL Rangers and the home stands were rocking!! Moving down to the concourses ah half time and the main topic amongst everyone, was how on earth were we not winning? I did what I had to do very quickly and was soon to be back in my seat awaiting the second half. After a 100 mph first half, the match dropped tempo a little and as time ticked on, it seemed more and more that Newcastle were more than happy with a point. But Rangers continued to press hard for that all important goal - Shaun Derry saw two headed chances go wide and Bothroyd was unlucky not to get a better connection on yet another Wright-Phillips teasing cross. Wright-Phillips himself saw a decent effort go just wide late on, but the Magpies held on to gain, what Alan Pardew claimed was a very good point. QPR: Kenny, Derry, Gabbidon, Taarabt, Bothroyd (Campbell 80), Faurlin, Traore (Connolly 51), Barton, Young, Wright-Phillips (Puncheon 88), Ferdinand. Subs: Murphy, Hall, Buzsaky, Smith, Puncheon. Man of the Match - so pleasing to have so many contenders with ALL of the debutants having extremely good games. Joey Barton was probably the quietest of the new boys in what, understandably, must have been a very difficult game for him. Adel Taarabt looked back to best and really played for the team and Shaun Derry was once again, immense in the R's midfield. But in the after match debate, Jo came in with her contender, which actually clinched the result. Myself and Lee went for Shaun Wright-Phillips, but Corp, California Hoop and Jo, all went for Alejandro Faurlin who was outstanding!! In summary, well, the ONLY disappointment was the Rangers didn't win, but on leaving the ground, there were smiling faces aplenty with the R's fans proud of their teams performance and there is genuine excitement building for the season ahead. With all due respect of course, it was amazing to see the R's line up tonight with such extra quality in the squad and there is now true belief that the R's are serious about taking their place in the Premier League. The R's now look forward to an away trip to Wolves this coming Saturday. Sadly, Lee is unable to make this one so you will have to make do with another ramble from me, possibly late Saturday night or Sunday morning. Tonight the 25 man squad list was released by the Premier League. The omissions from the squad include :- Rob Hulse, Danny Shittu and Hogan Ephraim. QPR today announced that Southampton forward, Jason Puncheon, has joined on loan until January 2nd 2012. Unfortunately, the deal was done too late for us to announce anything last night, but has been officially confirmed by the Club today. 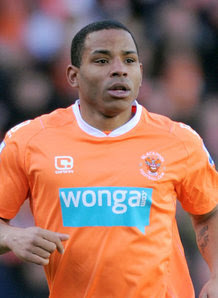 Puncheon, 25, joined Southampton from Plymouth in 2010 but spent much of last season on loan at Millwall and the Premier League new boys, Blackpool. Puncheon has also had loan spells at MK Dons and also played for Barnet for two seasons. "It just made sense to give him an opportunity to come in until January and show us what he can do. "This all happened very late in the day so I am very pleased we got him in. "Jason is a good acquisition because he brings pace and plenty of desire. "To be perfectly honest, he was so keen to come to QPR I think he would have paid us! "He is desperate to do well, and that really impressed me." All of us here at Lofty Heights would like to offer a warm welcome to QPR, Jason and wish you all the very best during your time in W12! !